As the travel industry continues to diversify and become increasingly niche market-oriented, many travellers are looking for in-depth and meaningful travel experiences. The renewed emphasis on heritage and historical travel in which the who, what, where, when, and why of “cultural studies” through the medium of travel has increased in its appeal, especially in domestic North American markets. The province of Québec has become a new and expanded “field study” for those who wish to experience up close the historical realities of this continent. And given Québec’s connection to France, there are increasingly new treasures waiting to be discovered here. For those who enjoy wearing the cultural anthropologist’s hat every now and then, Québec is an especially rewarding destination. To visit the official Québec Tourism website, click here. I finally came nose to nose with the Canadian Horse in one of my favourite areas of Québec, l’Outaouais (pronounced LOO-TA-WAY). As equestrians who have visited the area will tell you, this is idyllic horse country. Beginning just across the river from Canada’s national capital Ottawa, l’Outaouais is a region of great natural beauty, of magnificent rivers, hills, pristine lakes, and forests. And what is great horse country is great human country, especially if you enjoy peace and quiet and an abundance of nature. With her husband Jean and two sons Charles and Jonathan, Christiane Lalonde operates a breeding stable and equestrian school of very high quality. When I visited them we initially went for a walk among her herd of Canadians; the young geldings followed us around like puppy dogs. Watch Jonathan school a young Canadian gelding by clicking here. Like his father Robert, Michel Joly continues to breed Canadian Horses and to perpetuate the heritage of this breed and the equine culture associated with it. Robert was actually one of the original breeders who worked diligently to revive the breed. I enjoyed my discussion with Michel (click on the audio slider below the lead photograph) in part because he has a unique way of expressing why the Canadian Horse is so representative of historical and political issues in Canada. 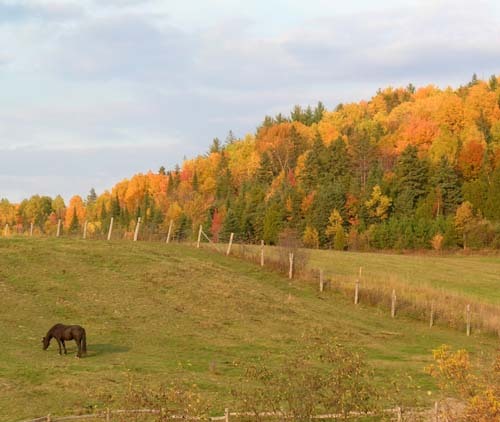 This is a wonderful nature reserve in l’Outaouais which offers magnificent outdoor activities including horse back riding. Chantal Courtemanche has a small stable of Canadian horses that will “transport” you on short treks or even overnight treks (in all seasons) through a truly glorious natural environment. She can be reached by telephone at (819) 436-9919. My thanks to Robert Anderson, owner-proprietor of this excellent executive-type villa property, for accommodation provided during my stay in l’Outaouais. For more information on Le cheval canadien or for information on breeding and horses for sale, visit this site. On this website, click on “Album des membres” to see some wonderful photographs of Canadian horses in action. This wonderful organization has a separate page for horses and ponies on their critical, endangered, vulnerable, and at risk list. One of the most celebrated of Canadian artists, Cornelius Kreighoff has left us a visual legacy of the Canadian Horse. My favourite is The Toll Gate (See above.) When Britain took possession of New France, local authorities instituted a number of regulations and policies — this is an understatement — that were not to the liking of the French-speaking inhabitants of what was then known as Canada. Toll roads were one of them. However, the agile and speedy cheval canadien could often circumnavigate that obstacle. This is the complete book about the Canadian Horse. Marie Lynn Hammond is a well known Canadian musician and singer-song writer. She is also of French and English heritage. Her song about the Canadian Horse is another medium for raising awareness of this significant part of Canadian culture. In May of 2009, Canada Post issued a stamp celebrating the Canadian Horse and the Newfoundland Pony. For more information, see Canada Post and the Canadian Horse and Newfoundland Pony.